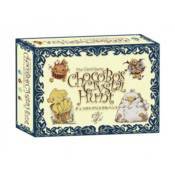 Help the Chocobos out on their Crystal hunt! Send your cute Chocobos on a journey to steal your opponents' crystals... before they steal yours! Use your intuition and observation skills in this fast-paced, fun and addictive game for all ages. All cards feature brand-new illustrations made specifically for Chocobo's Crystal Hunt. This is not a trading card game. Everything necessary to play the game is included in the package, so you are good to go right out of the box!